A pen name is a name an author uses in place of their real name when publishing. This name can also be called a nom de plume or pseudonym. The author's real name is likely known to the publisher but not to the public. Many authors have used pen names over the years. Some authors use a pen name in order to keep their real identity secret, such as a former spy writing a novel. Other authors use a pen name so they have a shorter name that is easier to say for branding purposes. Pen names have also been used by established authors who want to write in another genre and want to use the pen name to target an entirely different audience. Another reason an author might use a pen name is if their real name is the same as an established author writing in the same genre. The Guardian has a story by a writer who selected a pen name because a Man Booker-longlisted author was already using her name. Actors also run into this problem. For those seeking secrecy through a pen name there is another drawback, i.e. no touring or conference. The Guardian article says, "If you try to keep your identity secret, you can't go to events or festivals; be pictured in newspapers, or be open about your possible success. And, if you become hugely successful, you'll have to come out eventually – as Madeleine Wickham, the author of the Sophie Kinsella books, did. " Here is a discussion between CNN's Becky Anderson and Alison Potter (aka Ali Knight) about pen names and why writers use them. She chose Ali Knight because her publisher thought it was better for thriller novels. Potter says, "You need to tie your name to your genre." She says a real name might work better for general fiction. Some authors write under different pen names that are known publicly. Author Jayne Ann Krentz also writes under the names Amanda Quick and Jayne Castle. She writes contemporary suspense novels under Jayne Ann Krentz, futuristic romance as Jayne Castle and historical romance as Amanda Quick. If an author's name is branded under a specific subgenre then it clearly can help sell books when readers see the name in the bookstore. Harry Potter author J.K. Rowling was outed as crime novelist Robert Galbraith in 2013. Rowling said after being outed, "I hoped to keep this secret a little longer, because being Robert Galbraith has been such a liberating experience!It has been wonderful to publish without hype or expectation and pure pleasure to get feedback from publishers and readers under a different name." Nora Roberts explained her decision to use J.D. Robb as a pen name to us an interview. She says, "My editors and my agent had all suggested writing under another name so I could keep up the pace that's comfortable for me. I resisted. Just didn't "The plagiarism, and dealing with the fallout of it, was the most difficult thing I've ever faced since I started writing." like the idea of writing a story that wouldn't have my name on it. My agent finally said: Nora, there's Pepsi, Diet Pepsi, Caffeine Free Pepsi. (laugh) This I understood, and so agreed to give it a try IF I could do something a little different. I didn't want to write straight relationship or straight romantic suspense under a different name. So I came up with a romantic suspense/police procedural with continuing characters set in the near future." Stephen King wrote several books under the name Richard Bachman. He says in his FAQ that it was because the perception at the time was that authors should not write more than one book a year. King says, "I did that because back in the early days of my career there was a feeling in the publishing business that one book a year was all the public would accept but I think that a number of writers have disproved that by now. I'm one of them and the guy who writes the Along Came the Spider books is another one who's written two or three books a year. Danielle Steel usually publishes two books a year. So the public will accept more than one book from a writer in the course of a year." Wikipedia has a huge list of pen names used by famous authors. They include Lewis Carroll, O. Henry, Ayn Rand, Anne Rice, Diablo Cody, Dr. Seuss, E.L. James Stan Lee, Woody Allen and more. Choosing a pen name requires serious thought especially if you plan to use the name for multiple books or over your entire career. It is probably wise to consult with a marketing expert and your publisher. Mental Floss has an article about 8 different writers chose their pen names. Lewis Carroll selected his name with the help of his publisher. 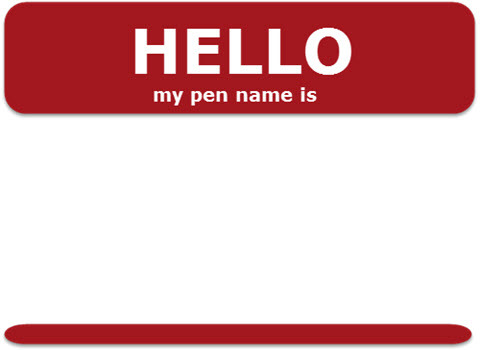 The Pen Name Generator was designed to help you come up with a pseudonym you can use. It creates a name based on different facts about you. You can also use it to create a random name.